I have shared my preference for light pasta sauces before, and had the chance this weekend to make my favorite pasta dish: spaghetti al vongole. 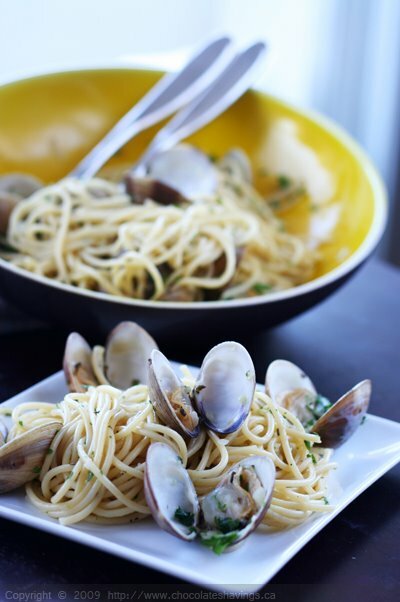 I have ordered this dish time and time again at Italian restaurants, and have yet to get tired of the light white wine sauce and the fresh herbs and clams that coat the strands of spaghetti. When I got my hand on a batch of fresh clams, I knew pasta al vongole would be mine again. I've heard a lot of people talk about their fear of cooking clams (and other types of seafood for that matter) but I can assure you that clams are incredibly easy to make. My all-time favorite way to prepare them is to steam them open with white wine, shallots and herbs. This takes a couple minutes to put together, and gives immense flavor to whatever you are serving the clams with. In this case, I dunk the cooked spaghetti right into the clam pot, let it soak up all the juices, and voila! Cook the spaghetti according to package instructions. In the meantime, add a good drizzle of olive oil to a stockpot on medium heat. Add the shallots, garlic and dried oregano. Cook until the mixture is translucent (about 3 minutes). Add the clams and the white wine and cover. After about a minute vigorously shake the pot to help the steaming process and make sure that all the clams open nicely. After about 4minutes, all the clams should have opened. Discard any closed clams. Add the drained cooked pasta to the pot and gently fold in the spaghetti. Season with salt and pepper. Add the chopped parsley and serve. Enjoy! Looks really delicious! I love seafood pasta with white wine sauce...delicious. I think Grumpy would really like this meal...I am going to have to bookmark this one. I have only cooked clams once in my life - and for the same reason you state here, I've always been afraid to! I think I better give it another try! This looks fantastic...and now I'm craving shrimp scampi. That's totally on the menu for this week - thanks! I think white wine goes so well with seafood. I truly love this dish, and would love a small bowl right now. Yum, this is one of my absolute favorite dishes. That's one of my all-time most favorite pasta dishes. Yours looks especially delicious! I can't believe I have never made this dish. I wanted to, several times, but something always gets in the way. I am heading to the market for some fresh seafood and I'm making it this weekend! It looks very good, however I am not a fan of clams..how do you think it would be with shrimp? Simple, pretty and delish...a fave "go to" dish. Sounds out of this world good!!! I love pasta and have to try this sometime. I love clams this looks great thanks for sharing. MaryBeth: You could definitely make this with shrimp. You can cook the shrimp in the same way as the clams (by poaching them in the white wine) and adding in the pasta as soon as they are opaque and pink in color. Let me know if you get to try it out! my absolute favorite use for clams. Talk about perfect presentation as well. Beautiful work! Seafood and pasta...what an amazing meal! This looks so delicious. I love simple pasta dishes and this is definitely one of my favorites. I've had dinner already but I'm craving this dish now! oh i absolutely love this dish too. it makes me feel thin for some odd reason. ha ha ha. try putting a bit of clam juice in when making the sauce like my grandmom did - it really spikes up the "claminess"
Yummeee! What a delightful idea for dinner!!! Anonymous: Feel free to change around the herbs to better suit your taste! And you're right, the clams should definitely be cleaned and all the sand should be removed before they are used. Looks really yummie:)!! I just love sea food!! It's one of my favorite dishes too - let me know if you get to try it out at home, I'd love to know what you think! I just (almost) followed a Giorgio Locatelli recipe which is slightly different from yours. No oregano or shallots. I used garlic, fresh chili, white wine (muscadet) and a bit of cream to round off at the end. My belly is still smiling, and my five year old daughter was yelling at me for not having made more! I have had an very large craving for spaghetti and clams....THIS spaghetti and clams. So glad I found it. Most recipes are way too butter laden. THanks!